There are a lot of substantive matters on the agenda for this meeting – primarily on the City Manager’s Agenda and in a dozen City Council committee reports covering a range of topics. Here’s a sampler of some items that I found especially interesting. The meeting is taking place at the Attles Meeting Room at CRLS (where the School Committee usually meets). Manager’s Agenda #9. A communication transmitted from Richard C. Rossi, City Manager, relative to Awaiting Report Item Number 16-43, regarding publishing a Cambridge Voter’s Guide to be distributed to each household in Cambridge a month before the 2017 municipal election. Manager’s Agenda #11. Transmitting communication from Richard C. Rossi, City Manager, relative to the appropriation of a $45,000 grant from the Massachusetts Department of Environmental Protection 604b Water Quality Management Planning Program, to be used to fund conceptual green street design plans for three public rights of ways, as well as guidance on green street implementation in space-constrained residential settings; with a focus on smaller scale reconstruction projects that are not part of larger utility reconstruction projects. For those who haven’t yet seen some of the innovative stormwater management projects in West Cambridge and along Western Avenue, you should check them out. It would be great if more of these projects could be done on a smaller scale. If done right, street trees might actually have a chance to flourish. Manager’s Agenda #14. A communication transmitted from Richard C. Rossi, City Manager, relative to a Planning Board recommendation on the "Friends of MAPOCO" Zoning Petition. Committee Report #2. A communication was received from Donna P. Lopez, City Clerk, transmitting a report from Councillor Dennis J. Carlone and Councillor Leland Cheung, Co-Chairs of the Ordinance Committee, for a public hearing held on June 22, 2016 to discuss a petition by Peter B. Kroon, et al, also known as Friends of MAPOCO, to expand the requirements of the North Massachusetts Avenue Sub-district (Section 20.110) applicable generally within the portions of the Massachusetts Avenue Overlay District (MAOD) zoned Business A-2 (BA-2). This zoning petition will likely now sail through to a 2nd Reading and eventual adoption as amended. Manager’s Agenda #15. A communication transmitted from Richard C. Rossi, City Manager, relative to authorizing the Purchasing Agent to award a five (5) year, two (2) month contract to the successful proposer on the Metropolitan Area Planning Council Bike Share System RFP. Manager’s Agenda #29. A communication transmitted from Richard C. Rossi, City Manager, relative to pursuing the planning and development of a multi-use, bicycle and pedestrian pathway along the Grand Junction corridor that links East Cambridge, Kendall Square, MIT, and Cambridgeport, with potential connections into Boston and Somerville. Manager’s Agenda #30. A communication transmitted from Richard C. Rossi, City Manager, relative to Awaiting Report Items Number 16-46 and 16-59, regarding the Grand Junction Greenway, including the status of construction, developer contributions, and the zoning overlay. It’s nice to see the cooperation of the Mass. Dept. of Transportation in these efforts. Manager’s Agenda #32. A communication transmitted from Richard C. Rossi, City Manager, relative to Awaiting Report Item Number 16-22, regarding the opposition to investment funds from the Retirement System. Some of you may remember the extensive public testimony and countless communications on the topic of the Cambridge Retirement System divesting any funds from any entity that is in any way supporting the production or upgrading of nuclear weapons systems. As it turns out, this was a typical Cambridge tempest in a teapot. As this report states: "upon reviewing the summary, that the Fund’s investments in the production and/or upgrading of nuclear weapons systems is de minimis." I hope everyone at least had fun making their speeches and writing all those letters that all turned out to be about nothing. Manager’s Agenda #33. A communication transmitted from Richard C. Rossi, City Manager, relative to Awaiting Report Item Number 16-54, regarding finding a long term solution to adding a dog park in East Cambridge by the end of 2016 and fencing in a temporary location for off leash use by the end of Summer, 2016. Take note, politicos: There are a lot of Cambridge voters who really love their dogs and want places for them to run and play. Actually, there’s a lot more interest in dogs than in nuclear weapons divestment. Manager’s Agenda #36. A communication transmitted from Richard C. Rossi, City Manager, relative to the submission of the attached Home Rule Petition that would authorize the City of Cambridge to include in the planned reconstruction (the “Project”) of the King Open / Cambridge Street Upper School and Community Complex (“KOCSUS”) the area that is presently occupied by the public swimming pool known as the Gold Star Pool (the “Gold Star Pool Site”) and to construct subsurface geothermal wells in a portion of Donnelly Field that lies directly along and adjacent to the current southerly boundary of the KOCSUS site (the “School Site”). Manager’s Agenda #37. A communication transmitted from Richard C. Rossi, City Manager, relative to the request that the City Council move to Executive Session. Manager’s Agenda #38. Transmitting Communication from Richard C. Rossi, City Manager, relative to the transfer of $42,655 within statutory accounts of the Public Investment Fund Community Development Extraordinary Expenditure account to complete the purchase of two parcels from the B&M Corporation for the purpose of creating a future multi-use path and greenway. These items are about making the necessary purchases to complete the Cambridge-owned portion of the Watertown-Cambridge Greenway along the now-abandoned railroad right-of-way. This will be a nice off-road addition when it’s finally complete a few years from now. 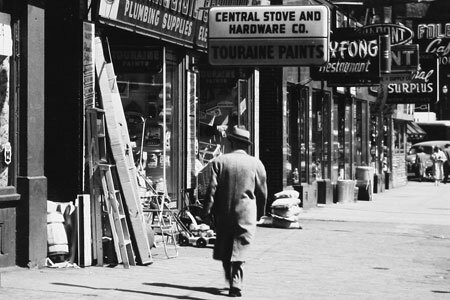 Whenever I hear people talk about preserving the "funkiness" of Central Square, I want to remind people that before Central Square was "funky" it was an incredibly vital shopping district. It’s really worth looking back at some of the available "Perceptual Form of the City" photos from over 50 years ago. This application to allow the display of mechandise on the sidewalk in front of Pill Hardware reminded me of one of those old photos. It’s also a scene you can see today in Inman Square. The image shown is actually the frontage where the Mass & Main project is planned. This is the kind of thing some of us would love to see in some form as Central Square rediscovers its past and defines its future. It doesn’t have to be just overpriced bars and restaurants. This is a triple celebration – a birth, a marriage, and a retirement. Cambridge feels like such a little village sometimes. Traffic laws pertaining to crosswalks are enforced? That’s news to me. If we’re taking requests, how about let’s also start enforcing the requirement that motor vehicles must be parked less than a foot from the curb. That would make cycling safer. I never see that enforced. This is included here only because I’m curious what’s behind it. [Read the Request for Proposals] The RFP says: "In short, the expected result of this study is a commercial land use classification system that makes sense in modern Cambridge, that would be understandable to all community members, and that would be able to effectively regulate commercial use types as they evolve. Based on the study recommendations, the City would determine how the zoning could be amended to fit the recommended system, through either targeted changes to the current ordinance or a more substantial restructuring of the Table of Use Regulations." Uh, OK.
Committee Report #8. A communication was received from Donna P. Lopez, City Clerk, transmitting a report from Councillor David P. Maher, Chair of the Government Operations, Rules & Claims Committee, for a public hearing held on June 29, 2016 to receive an update regarding the City Manager’s Search in the Focus Groups that took place and the development of the draft profile. I’m taking bets now on whether the City Council will successfully meet its proposed September 26 date for selecting the next City Manager. Even if they do make a decision by then, it’s likely that there will still be a period of time before the new City Manager can take the reins (unless it’s an internal candidate).